The amenities at Beach Club I afford your family a nice, memorable North Myrtle Beach vacation. 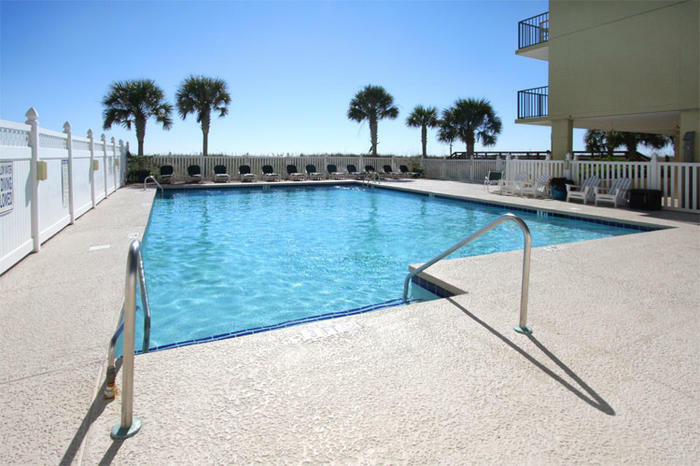 There is so much privacy to enjoy in this mid-size North Myrtle Beach resort that is beautifully located on the oceanfront. Every North Myrtle Beach vacation rental at Beach Club I has a direct oceanfront view from its balcony. And each balcony in these condos in North Myrtle Beach, SC is accessed through the comfortably furnished living room and the master suite. The North Myrtle Beach condos at Beach Club I are not a glorified hotel room. On the contrary, these North Myrtle Beach condo rentals are spacious and feature all the creature comforts of home. They each boast a well equipped kitchen that includes far more than a microwave and a coffee maker. These North Myrtle Beach vacation rentals also have a dishwasher, full-size refrigerator, oven, stove and breakfast bar. With all of these amenities at your fingertips you can start your North Myrtle Beach vacation day with much more than a pot of coffee. You can have a quick bowl of cereal or even prepare a hot breakfast of eggs and toast. Eat your meals or snacks at the dining table or enjoy them al fresco. With the balcony furnishings it is quite easy for you to take food outside and watch the Atlantic Ocean while you sit and eat. Beach Club I boasts large condominiums with three or four bedrooms. All of these condos in North Myrtle Beach have three baths and most of these North Myrtle Beach vacation units sleep eight people though a four-bedroom North Myrtle Beach rental at Beach Club I can accommodate 11 folks. All of these North Myrtle Beach rentals have a sleeper sofa in the living room. In this day and age no one wants to be without their electronics and gadgets and connection to the outside world so Beach Club I makes it easy for you to plug in. There is Internet access at this North Myrtle Beach resort and each North Myrtle Beach condo has televisions and at least one DVD player. For your added convenience, the condos at Beach Club I each have a washing machine and clothes dryer. Bring some detergent and you are all set to take care of your family’s laundry after they play hard on the beach, sweat it out on the championship golf courses and spend the day hiking the oceanfront park’s trails. On the beachfront at Beach Club I there is a pool deck where the sparkling blue swimming pool invites you to enjoy minutes or hours in its refreshing waters. You can see the beautiful Atlantic Ocean from your vantage point on the pool deck and you can hear the waves as they crash onto the white sandy beaches. Being outside while you are at this North Myrtle Beach resort is so soothing. The beaches fill with families and the pool deck is filled with all ages. Play on the sand and build sand castles that are worthy of a photograph. Walk on the beach and head towards the not-so-distant fishing pier. Collect seashells to take home with you as souvenirs of this North Myrtle Beach vacation. Beach Club I is centrally located to amusements and attractions galore. Ride the Myrtle Beach SkyWheel and get a whole different perspective on this seaside town. Meander the new oceanfront boardwalk in Downtown Myrtle Beach, SC and watch for dolphins right offshore. Ride a roller coaster and zip down a water slide during your North Myrtle Beach vacation. There are miniature golf courses every which way so choose one that looks most appealing and challenge the kids to 18 holes of putt-putt golf. Ice cream shops, souvenir stores and seafood cafes are part of the Myrtle Beach landscape, too. Play a number of the Myrtle Beach area golf courses during your North Myrtle Beach vacation at Beach Club I. There are more than 100 golf courses so finding a tee time that fits your vacation schedule is quite easy. Bring your golf clubs and bask in the sunlight while you enjoy the beautiful landscape of a North Myrtle Beach golf course. Hit the outlet malls, charming boutiques and antique stores while you are in town for your North Myrtle Beach vacation. There are so many fun places to walk around and window shop and find fabulous treasures that you can take home with you. Seafood is almost always on the menu at North Myrtle Beach area restaurants. You can find seafood for breakfast, lunch and dinner. Shrimp, oysters, crab legs, clams, grouper, flounder and more are available for your dining pleasure when you vacation in North Myrtle Beach, South Carolina. There are seafood buffets, fine dining restaurants and beachfront cafes. After dinner why not take the family to a production at one of the nearby live entertainment theatres? Palace Theatre, Alabama Theatre, Carolina Opry and Pirates Voyage are just the beginning of a list of Myrtle Beach area live entertainment theatres and the shows are remarkable. Elliott Beach Rentals is not affiliated with onsite management or the HOA of Beach Club I.